Are you an English teacher? You might also like Surprising English Teaching Facts I Learnt Last Week: Advice From 4 Experts. As you may have noticed, I’ve been away! Last week, I was at a big teachers’ conference in Slovenia full of big teachers and big names. I even got to meet one of my heroes! That’s David Crystal, probably the world’s top expert on the English language. He also happens to be a pretty funny guy, too. Anyway, enough about my new friend. What can YOU learn from this conference? Well, David gave a fascinating talk about the English language, and despite the fact that I’ve got an MA in linguistics, a lot of it came as quite a surprise. I mean, do you know the answers to these questions? What’s the earliest written English word? How many new words enter the language every year? How much of English comes from other languages? No? Well, neither did I — until last week! Most of these questions have the same answer, so better get used to it! But what does it depend on? Well, David talked us through this. He talked about how he checked the Oxford English Dictionary and came up with one number. But then he had to check the Merriam-Webster Dictionary (the American English dictionary) and came up with a different number. By the time he’d combined the numbers and removed the repetitions, he’d come up to about 750,000 words. What about all the technical terms? There are hundreds of thousands of words that only lawyers use and words that only engineers use and words that only crocodile hunters use. None of these words is in the dictionary — so that means we have to add even more. Finally, we should include all the species of animals there, too, right? I mean, if “monkey” is a word, and if “chimpanzee” is a word, what about “spider” and “Aphonopelma anax” (it’s a type of spider)? There are over 900,000 types of insects that we’ve given names to. And there are 35,000 species of spider with their own subgroups — which means even more words! So, the short answer to this question? Millions. There are millions of words in English. But how many do we actually use? I mean, we should know how many words we know. When you first saw this question, I bet you were surprised by how you had no idea about how to answer it, right? Well, don’t worry — that’s how I felt, too. Unsurprisingly, David Crystal has researched this in the same way that he likes to do a lot of his research — by sitting down and counting words. It’s his hobby! He loves it! This time he took a section of the dictionary, presented it to different people, and asked them to tick the words they knew. He then multiplied the result to match the size of the dictionary. Again — the result was kind of surprising. Everyone in the room, he assured us, had at least 50,000 words. At least. But probably a lot more. There wasn’t a big difference between “native speakers” and “non-native speakers” when it came to word count. How well educated and how well read you are makes a bigger difference. So if you read regularly in English, and you can understand this blog post, you’re probably somewhere approaching 50,000 words. What about the oldest written word — the first thing we’ve got to show about the existence of English? “Raihan.” “Raihan” is the answer. It’s the earliest written word in English and is dated back to the year 420. OK — but that doesn’t mean much without an explanation, does it? This word “raihan,” or “roe deer,” was actually written on a roe deer bone. Why did they write “roe deer” on a roe deer bone? You’d think that this meant that it was just a label, right? But David has another theory. Back in A.D. 420 — before the internet, crime books and even before Monopoly — people had to find stuff to do in the evenings between working in the fields and sleeping. So they played games. One of the games might’ve involved taking a container full of different bones and having a competition to see who could find the roe deer bone first. Fun-sounding game, right? They might have imaginatively called it “the roe deer game.” Maybe. Anyway, to avoid another disagreement like that, they decide to label the roe deer bone. With the words “roe deer” (or “raihan”). The first word! (And an idea for a terrible game you can play next time your electricity gets cut off, and you have lots of animal bones in your house, for some weird reason). This one’s quite simple, too. It’s about 1,000 new words a year. That’s all — just a fact. I’m not even doing a picture for this one. Something you can tell your friends next time you’re at a dinner party. Or if you’re stuck talking to someone you don’t know and who’s just looking at you, waiting for you to say something interesting. How much of English is from other languages? OK. The difficult part of this question is deciding what “other languages” means. As you probably know, English is a bit of a mixed language. Some Vikings turned up for a bit in the north and gave everyone some nice new words, but most of them stayed in the north and a lot of people didn’t notice very much. The French came and took over. The old Germanic English started mixing and socialising with the new French. The internet happened, and now no one speaks properly anymore. LOL. So when we say “foreign words,” what do we mean? Well, if we look at non-Germanic words (so counting anything entering the language after stage 1 of my short history), we’re looking at 80% of the language. Yep — you could argue that only 20% of English is actually … English. This is when David made an interesting point. Think about your own country. I’m guessing that in your country there are people who are getting worried, upset and even angry about the influence of English in your own language. This is a natural reaction — the English language is taking over the world, and we hear English words everywhere now. But here’s the point: English is only 20% English! If English let in all these words from other languages (over 600 languages), and now it’s the world’s most spoken language, surely we can argue that the influence of other languages is GOOD for a language, not bad. I know this idea is probably quite controversial (it’ll create strong opinions), and it’s just an idea. (I’m not saying I agree with it.) But I’d like to know how you feel about this. Let me know in the comments! You’re talking to someone and having a great conversation — about the new Star Wars film probably. That’s all I ever talk about. Anyway — whatever the topic — you’re in this conversation. But you can’t remember a word. Probably a bit weird if you did that, right? The usual solution in this situation is to make some sort of sound to signal that we’re trying to remember a word or that we’re just gathering our thoughts. But there’s something else we do that’s a bit weird. Yep — “watch’ya’callit” is sort of a real word in English. The problem is, no one knows how to spell it. So it never gets into the dictionary. Apparently, we’ve got about 30 of these “filler” words in English. “Thingy” — for a politician. Not really — for a thing. Of course. 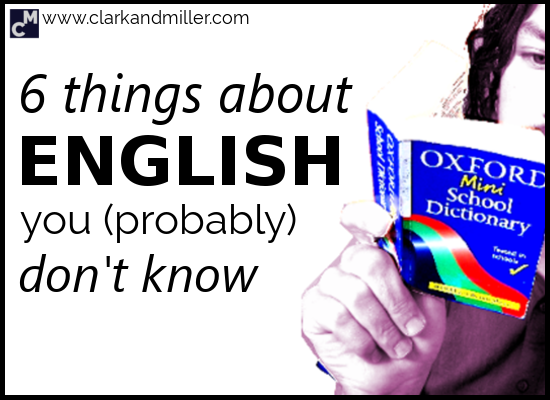 OK. That’s it — 6 weird things you (probably) didn’t know about English! All of these are actually from David’s book, The Story of English in 100 Words. If you thought these were interesting, there’s about 94 more of these, including one on swearing (which is f**king fun!). Go ahead — treat yourself! But what about your language? Every language has its own story and its own weird facts. Are there any strange things about your language? Tell me in the comments, and we can share the knowledge (and have a good laugh, too!). Did you find this useful? Do you know any people (or pigeons) that might also benefit from this? Then BE AWESOME AND SHARE! Spread the knowledge! We kind of use “thing” or “thingy” like that. Does “truc” have any meaning at all? Or is it pure filler? In Italian , my language compared to your “ thing” or “ thingy “ we tend to use “ coso” or “ cosa “ …you know that “ coso “ there ….or even “ affare” , but always with that meaning , trying to whip up other person to help you in your “ blank” memory. Does it have a meaning in itself — or is it just a filler? If I had known you were planning to meet David Crystal, I would have sent you my copy of “Discovering Grammar” through the post for him to sign. How do you like my 3rd conditional!? Very classy 3rd conditional there. It’s rare that it’s used, yet alone so well! Well done! I haven’t read “Discovering Grammar” yet. Worth a read? I’ve just finished “Making Sense,” and it was excellent! My favourite is probably “The Stories of English,” though. Hello, I really enjoy reading your words. I just saw this sentence and thought, “mmmmmm why is the verb in the singular form ?” So here’s the sentence: How well educated and how well read you are makes a bigger difference. This is a really smart question, Miguel. I looked into this phenomenon a little more. Basically, we’re looking at “subject verb agreement” (how the verb behaves based on the subject). Clearly, when writing the sentence you quote, I was considering “being well educated and well read” as a single entity. I could just as easily have written “How well educated and how well read you are make a bigger difference.” Both these sentences are the kinds of sentences you’ll hear in natural speech. I do like your blog and became addicted to Voscreen. Thank you for another wonderfully written article. Although I was surprised you haven’t mentioned Latin and Ancient Greek influence in English. Yes, there is, of course, a massive influence of Latin and Greek in English, too. It’s such a mongrel language that it was kind of impossible to cover everything and keep the blog post short and fun.